Fall is my absolute favorite! 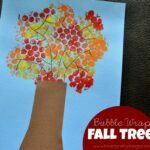 We’ve already had fun celebrating fall with some pretty tree crafts but we had another idea for a craft this past week that I had to share with you. 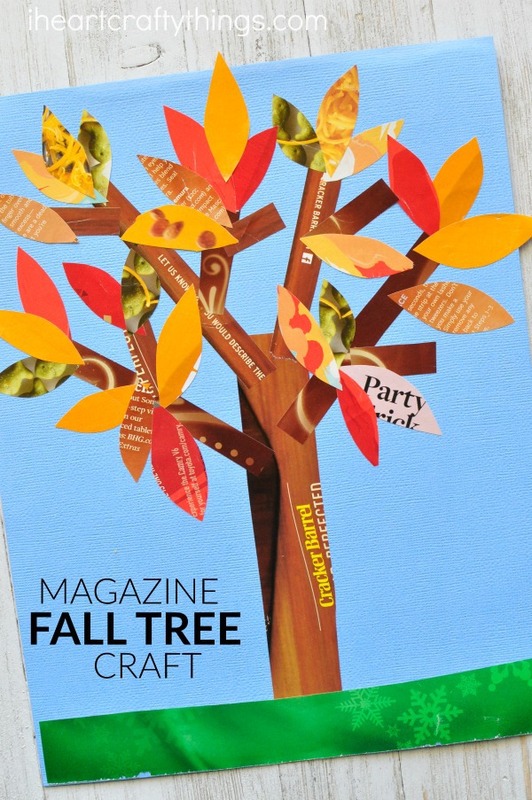 If you love to find fun ways to recycle materials into crafts you are going to love this magazine fall tree craft. It’s colors are vibrant and gorgeous and the pictures and words on the magazine pages add such amazing texture to the overall craft. 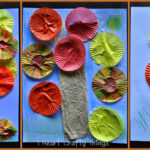 The best part, the craft only requires four materials, all of which you probably have already on hand at home. Look for some fun book recommendations at the end of this post. 1. Start by looking through a few old magazines for pages that have lots of fall colors on them like brown, orange, red and yellow. Cut or rip those pages out of your magazines. 2. 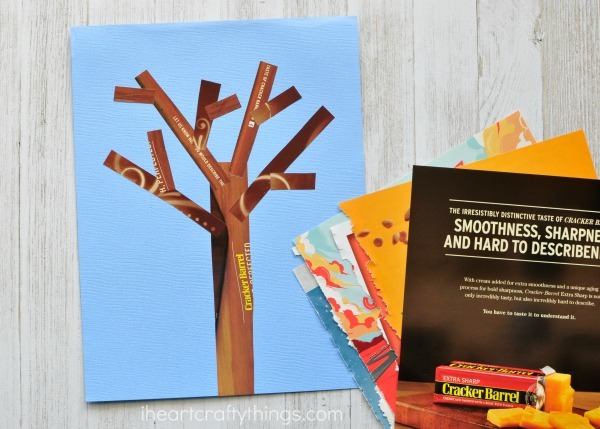 Cut out a rectangle tree trunk from one of your brown magazine pages and glue it onto your light blue cardstock. 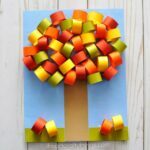 Then cut out smaller rectangles from your brown magazine pages and glue them around your tree trunk for tree branches. 3. 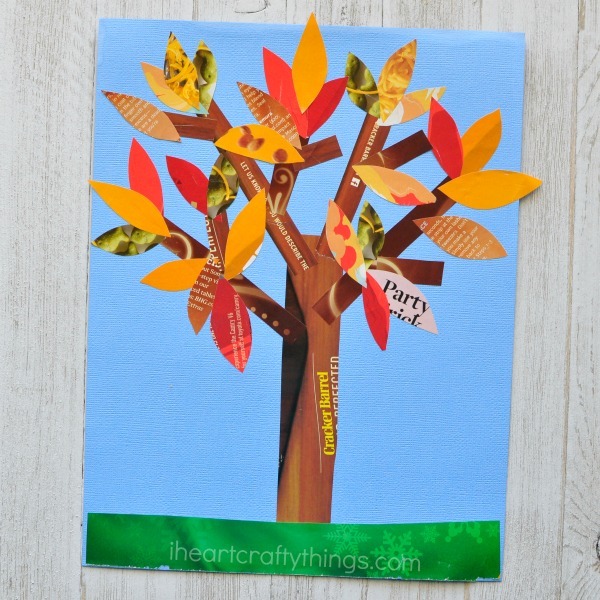 Cut out leaves from your other red, orange and yellow magazine pages. 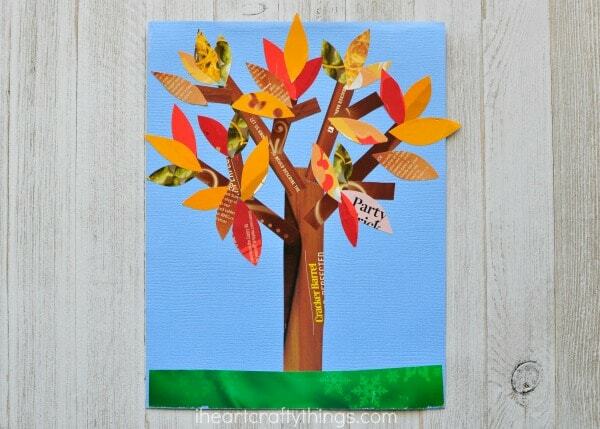 Then glue them all around your tree branches to finish your magazine fall tree craft. 4. While we had our magazines out we also found a page with a section of green and cut a strip out for grass and glued it onto the bottom of our paper. This step is totally optional.